what use is a 512 byte packet when we only want to s end a carriage return character? We have already solved the problem of data transparency as Hank has pointed out. 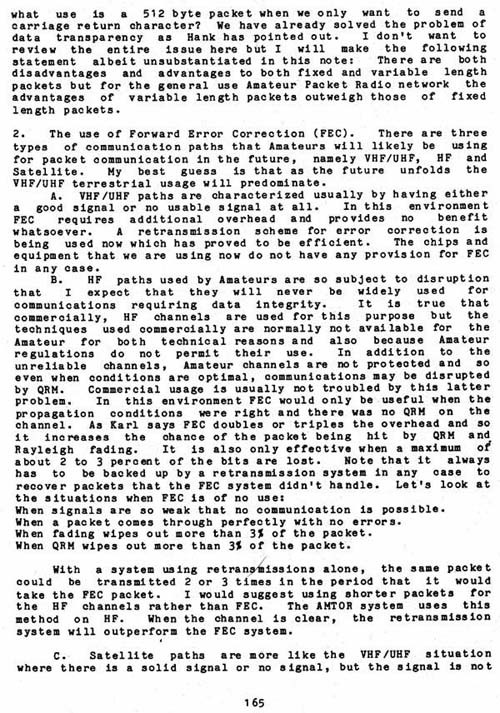 I don't want to review the entire issue here but I will make the following statement albeit unsubstantiated in this note: There are both disadvantages and advantages to both fixed and variable length packets but for the general use Amateur Packet Radio network the advantages of variable length packets outweigh those of fixed length packets. 2. The use of Forward Error Correction (FEC). There are three types of communication paths that Amateurs will likely be using for packet communication in the future, namely VHF/UHF, HF and Satellite. My best guess is that as the future unfolds the VHF/UHF terrestrial usage will predominate. A. VHF/UHF paths are characterized usually by having either a good signal or no usable signal at all. In this environment FEC requires additional overhead a nd provides no benefit whatsoever. A retransmission scheme for error correction is being used now which has proved to be efficient. The chips and equipment that we are using now do not have any provision for FEC in any case. When signals are so weak that no communication is possible. When a packet comes through perfectly with no errors. When fading wipes out more than 3% of the packet. When QRM wipes out more than 3% of the packet. With a system using retransmissions alone, the same packet could be transmitted 2 or 3 times in the period that it would take the FEC packet. I would suggest using shorter packets for the HF channels rather than FEC. The AMTOR system uses this method on HF. When the channel is clear, the retransmission system will outperform the FEC system.